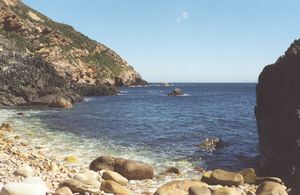 The dive site Blouklip, Bloukrans or Blousteen is an inshore rocky reef in the Rooi-els area on the east side of False Bay, near Cape Town in the Western Cape province of South Africa. This site is more protected than most in this area from the south westerly swell, and is accessible from the shore. 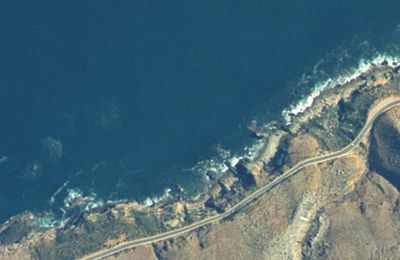 Variously named "Blouklip", "Blousteen" and "Bloukrans" for the dark rock ridge of the "Tygerberg" formation at the entry point. The mountain range behind the site is known as the Blousteenberge, and the peak directly above it is Rooielsberg. 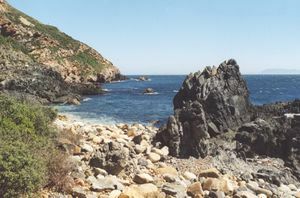 Inshore is moderate size boulders and outcrops. Further out they get lower until at 10m there are fairly flat gravel beds. Further out are more outcrops, some flat shale reef, more gravel beds and yet more outcrops.There are also some little patches of sand amongst the rocks and gravel. Geology: The area is noted for the conspicuous surface deposits of manganese ore. 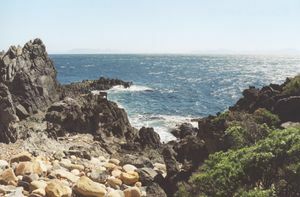 The dark rocks near sea level are outcrops of the Tygerberg formation of the Pre–Cambrian Malmesbury series, similar to those at Gordon’s Bay. The unconformity between this formation and the sandstones of the Graafwater formation is fairly close to the water here, and visible in places, though usually covered by scree. Best during or after south easterly winds (summer). This area can be exposed to the south-easter at times when it blows parallel to the local shoreline from the Kogelbaai, and if strong this can push up a nasty chop. In these conditions the boulder beach to the south west of the outcrop will be sheltered from the wind and chop and will make a suitable alternative exit. 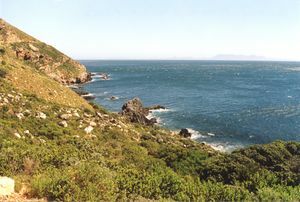 There is a paved off-road parking area about 90m towards Kogelbaai (north east) from the top of the path. Shore access requires a long walk down a steep path and a slightly tricky entry and exit. No special skills required. The area is suitable for snorkelling. This page was last edited on 1 December 2010, at 05:33.